People who use Microsoft Outlook to send and receive e-mails, here is add-in available from Microsoft using which you send SMS right from your outlook. This add-in works with Outlook 2007 and Outlook 2003. 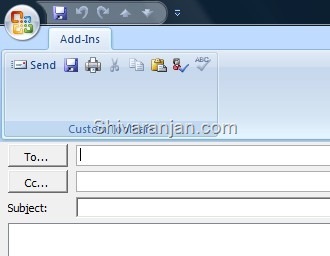 How does Microsoft Outlook SMS Add-in work? Microsoft Outlook SMS add-in uses the built in modem of your Phone to send SMS messages via Bluetooth, Infrared, USB and Serial interfaces. To be able to send SMS using this add-in your phone should have a modem that can be interfaced by any of the supported connectivity options available. Manage SMS messages just like emails, Save drafts, Sent items, Print. Lookup and resolve phone numbers to your existing Microsoft Outlook contacts. Use speller and proofing tools. I was able to successfully send SMS messages from Outlook but it initially it refused to detect my Nokia 6630′s modem. But after trying for two or three times it detected the phone and I was able to send SMS message. I could not try this with Outlook 2003, if any of you try then let me know your feedback. Generic Viagra is an exact reproduction of its brand as distant as its security and functioning is bothered, the only difference being their prices and color. The FDA approved Sildenafil citrate is utilized to cross-examine more blood into the male phallus, so that a sexually stimulated, erectile dysfunction affected masculine gets a harsh hard-on. Its entire for all practical purposes is witnessed in as less as 1 hour. descendants – i am steve mcqueen 2014, goldberg eisenberg til death do us part 2013.